Hi, I’m Drew Lawless, the owner of Lawless Painting. We are licensed and insured and satisfaction is our guarantee. 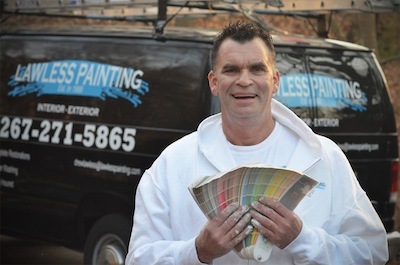 Lawless Painting was established in 1988 and has been servicing and satisfying customers in Philadelphia and surrounding counties for over 25 years. Our customers consistently say that we are knowledgable, thorough and professional. The key to our success is organization, preparation and hard work. Our specialities include Interior & Exterior Painting, Paint prep, Custom Painting, Wall Paper, Removal, Dry Wall Repair, Plaster Repairs, Wood Replacement, Color Consulting, Pressure Washing, Painter for a Day, Interior & Exterior Staining, Cabinet Painting, Custom Wood Working, Epoxy Floor Coating, Roof Deck Coating.